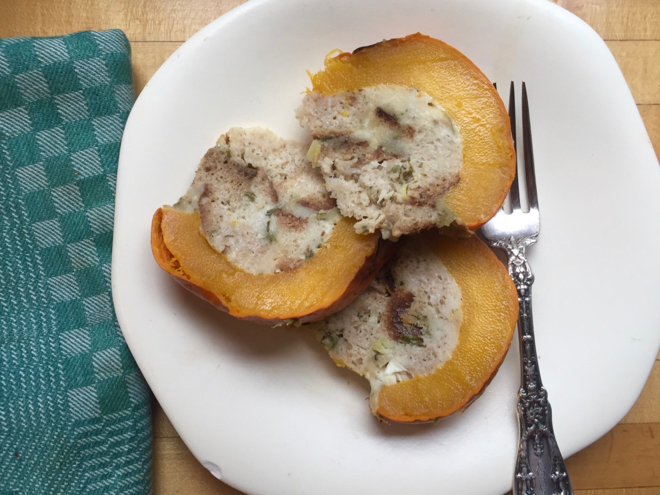 This is the most delicious, beautiful fall dish. It’s perfect for a regular old dinner (though it does take almost 2 hours to bake so maybe a weekend dinner) or a Thanksgiving treat. But it’s so easy and so adaptable that you should add it to your regular repertoire. It’s wonderful with cooked rice instead of bread, additions of cooked spinach or chard, cooked sausage . . . In a large bowl toss the bread, cheese, garlic, bacon, and herbs together. Season with pepper and salt and pack the filling into the cavity. 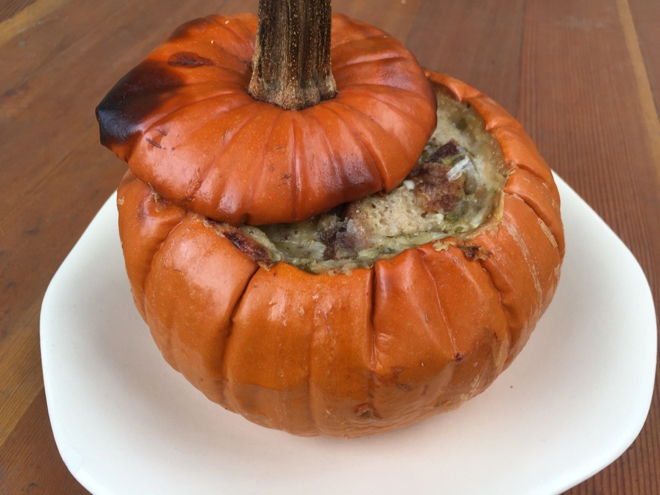 The pumpkin should be well filled—you might have a little too much filling, or you might need to add to it. Stir the cream, milk and nutmeg with a bit of salt and pepper and pour it into the filled pumpkin. You want the liquid to come about half-way up the cavity. It’s hard to go wrong though. Better a little wetter than too dry.